• 24V DC misting pump, capable of running up to 10 nozzles. Pump is very robust and can run dry!!! This pump has been extensively tested for a long time in the field and in the factory. It has extremely low failure rates and it simply WORKS! Pump is adapted for 1/4" tubing and includes vibration dampening rubber feet. • 1 Value L misting assembly. Assembly is tested and it includes our super low flow check-valved spray tip, custom crafted in black with an average droplets size of ~50 microns. Check-valved tips greatly reduces the post mist drip. These nozzles can be adjusted and positioned in any direction. Can be securely fastened to any surface up to 0.625" (5/8") or 1.5 cm thick. This misting assembly is patented at USPTO. • Reservoir bulkhead with O-ring and plug. • Digital Seconds Timer ST-24 - with instructions. Starter System can silently run 1 nozzle or as many as 10 nozzles. 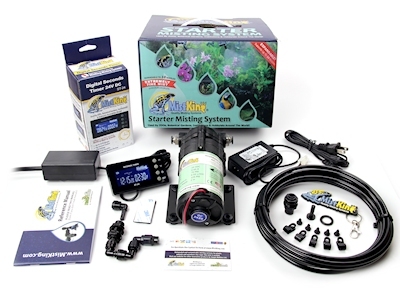 Mist king systems have been applied in a multitude of applications, from patio cooling, reptile, amphibian terrarium/vivarium enclosures, growing shelves with orchids or exotic plants, hobby greenhouses, and even grocery and industrial applications. Major ZOOs, botanical gardens, educational institutions, corporations and individual hobbyists all are using our systems throughout the world. We do not ship reservoir buckets with the kit. No need to add to the shipping cost for something that can be picked up locally for a few dollars. Our misting systems come with instructions and push in bulkhead fitting to convert any bucket or container into a reservoir. Plastic pails cost from $3-$8 retail depending on size.